I spent two days in pediatric and it sure was busy. We started the day off by doing rounds of the three different pediatric wards in the hospital; yes I said three, I was shocked too. We started off rounds in the Neonatal Intensive care unit (NICU) on the main floor and finished with the three isolation rooms, for kids that are highly contagious or those who could be seriously compromised if they are exposed to other's sickness, on the third floor. I am not entirely certain how they determine which floor a patient goes to, but it was heartbreaking to learn the cause behind all of these tiny children in the hospital. Although the doctors explained the cases of each patient in English, for my benefit, they sometimes talked so quietly that it was difficult to hear. The first newborn that was discussed looked so small, in the little baby incubator. She had this semi circle dome over her head, which served to provide her with a higher concentrated oxygen supply (there was a tube they ran through the top that provided the oxygen. They also put a layer of cellophane over the baby, attached to the walls of the incubator. The purpose of this is to act like a greenhouse, keeping in the heat. This baby was only a couple of days old and she suffered from meconium aspiration syndrome. Meconium is the first feces passed by the baby, this may occur when the baby is in the uterus as a result of stress to the baby (decreased oxygen level or blood supply), the baby may aspirate the meconium in the uterus or it may happen directly after birth. 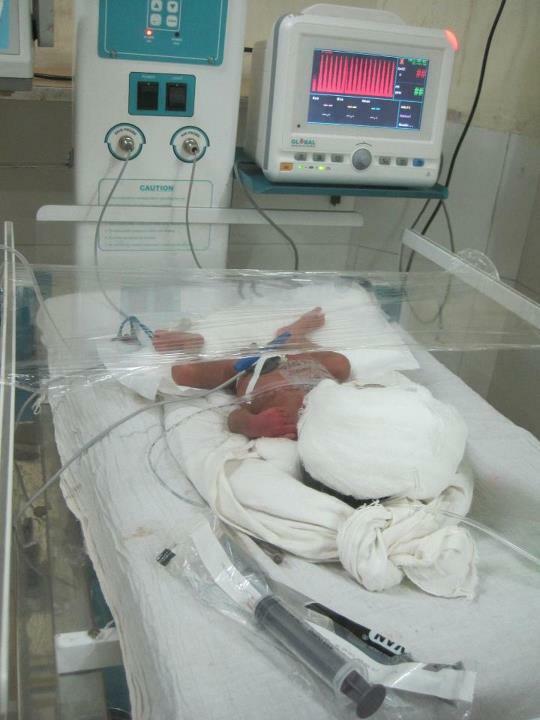 This particular baby was experiencing breathing difficulties as a result of meconium aspiration. When the resident was done presenting the patient the head doctor, Dr. Shrecondey, drilled one of the interns about the effects of increased respiration rate. As she was doing her best to answer the question he asked her how she would feel if her respiratory rate increased to 60 per minute, then he told her to look at the clock and try it. When she was done he asked her how she felt and she said not good (at this rate you begin to feel light headed). With her response, he asked her "now can you understand why this is a problem for this baby, who has a constant increase?" After this we discussed the other five babies in this NICU. By the end of the day we saw many babies suffering from meconium aspiration syndrome and on the second day there were even more. Finally Dr. Shrecondey asked them if they thought there might be a reason that there are so many babies suffering from this. When no one answered he said "you guys are supposed to be doctors and that means not only treating the patients, but questioning the cause for what ails them." I thought this was great, and it was especially interesting because it looked like none of them had ever considered thinking about a chief cause. As they stared at him blankly he told them what he thought. He told them that he sees a strong correlation between mothers who are induced with misoprostol during labor and newborns with meconium aspiration syndrome. He also said that misoprostol should only be used when the survival of the mother is at stake because of the potential damage it can do to the newborn. I thought this was really interesting, especially because I saw so many mothers being induced with misoprostol when I was posted in maternity, so I looked up a few studies when I got home and they all said the same thing as Dr. Shrecondey was trying to explain. What I have noticed in maternity, is that a lot of the procedures are done because they are protocol and not because it is actually necessary for all patients. This becomes a problem as their protocols may cause harm to either the mother or the baby. After leaving NICU we went into one room of the ward where there were five very small children. One of the beds held a very small baby who appeared to be suffering severe malnutrition. When the mother was asked about breastfeeding Dr. Shrecondey became upset with the residence for not making sure that she was feeding more often. From this, what I assumed is that the mother said that she is breastfeeding but she isn't producing enough milk for the baby. He told the residence to explain to her that she needs to feed more regularly because the more she feeds the more milk she will produce. In another bed there was another girl suffering from cerebral palsey and this was the first of many children we would see that day with cerebral palsey. In the next room I was shocked by the dearth in knowledge that these doctors had about folic acid. I am still hoping that they were just nervous because of Dr. Shrecondey's question, instead of completely unfamiliar with what it meant to explain preconception folic acid supplementation. They were having this conversation because there was a woman sitting on one of the beds with her baby wrapped in a blanket and Dr. Shrecondey had asked her a few questions. I am guessing one of them was what she knew about taking folic acid before her next pregnancy. When she didn't know what he was talking about Dr. Shrecondey started yelling at one of the interns "I told you on the phone last night to explain preconception folic acid to her, do you want her to have another baby with anencephaly? This is preventable but if you don't do your job and explain it to her then how is she supposed to know?" When the resident looked confused he was asked if he even knew what was meant by preconception folic acid and he responded that he told her to take folic acid once she became pregnant and then he was silent. After waiting a very long time, one intern finally stepped in and did her best to answer the question properly. I was relieved that she knew the answer, but I was also very surprised that no one else spoke up. After studying nutrition, I know a lot more about folic acid than many people do. I have done projects and written papers about it. Even without a background in nutrition, this is one thing that I thought these doctors would know without a doubt because it is their job to teach the patients and to look out for their health. Since I thought it would be inappropriate to speak up, I kept quiet, but this is what I know about preconception folic acid supplementation: within the first 27 days of conception, the brain, skull and spine are developed. During this time it is crucial that the fetus has enough folic acid because it is crucial for the proper formation and closing of the spinal cord and brain. Without adequate folic acid in the first 27 days there is irreparable damage to the central nervous system which could lead to neural tube defects such as anencephaly or spina bifida. Women can get folate (form of folic acid found in foods) from green leafy vegetables and they can also take folic acid supplements. Since 1998, in the US, all of our breads, cereals, and pastas are fortified with folic acid. This is not the case in Loni, however healthcare for pregnant women is free, which means they could get folic acid supplements for free if they know to ask about it. Another thing that might be a great idea to start here would be programs where they have women who are getting married begin taking folic acid. Since a women should begin taking it the minute she decides she might become pregnant (what Dr. Shrecondey was trying to get the other doctors to understand) and since pregnancy usually occurs within the first year of marriage here, that would be a great time to start taking it as a supplement. Another interesting thing that I saw, which I was completely unfamiliar with, was a child with arthritis caused by a Staphylococcus aureus infection. In the afternoon I learned that the infection causes arthritis in the joint that is either stationary or migrating (the pain moves from one joint to the other). The only treatment is to give an injection of penicillin every 21 days for the rest of her life. In another NICU there was a woman sitting with her baby. The baby was malnourished because the mother had stopped lactating because due to she depression. Dr. Shrecondey explained to me that her mother and father did not care for her and neither did her husband's mother or father. She was alone and she was scared for her baby, which caused her to be depressed. The doctors planned to get social services to help her out with her problem and told her to stay in the hospital with her baby so that they could help support her. The last room in the first ward was the room where they taught mothers to do kangaroo care for their premature babies to help them thrive and grow. Kangaroo care is when a mother has 24 hour skin to skin contact with her baby. There were two mothers (one had triplets) sitting in chairs, on both of the days I came through, with their babies on their chest. This has been shown to really help the babies because it gives them the warmth that they need, places the baby near familiar sounds from the womb (heartbeat, respiratory sounds, and peristalsis), and it provides them with the love they need to help them in a time when they are fighting to survive. It is such a great idea that has helped a lot of premature babies. Another great thing about it is that it allows mothers to do something to help their baby grow, which also helps them to not feel helpless when their babies might be struggling to hold onto life. On the second floor there was the most adorable little girl sitting on her bed with either her mom or her grandma eating a banana. She was all smiles in her dirty little dress with her hair in a ponytail on top of her head. She didn't seem sick at all. It turns out that she came in a few days before in a coma with an extremely low respiratory and heart rate. She had been bit by a snake. Thankfully her family was able to get her to the hospital in time so that they could treat her. She was to stay in the hospital a few more days for observation. After the first floor I was exhausted and we still had two more floors to go. This is a daily routine for Dr. Shrecondey and seeing so many patients is a lot of work. The last thing I saw on rounds that was really hard was a three month old baby who had tested positive for HIV. When she was born they did the test and she was negative, but three months later she took the test again and it came back positive. It was so heartbreaking. In the bed next to her was a girl that was about 8 who was also suffering from HIV and tuberculosis. These two are commonly found together and tuberculosis is very common among the patients we saw. The room that these patients were in was the antiretroviral treatment room (ART room), there were four patients in this room and they were all so sick and tired looking. It was very heartbreaking. Throughout rounds Dr. Shrecondey was constantly yelling at the residence that presented the patients to him. As much time as he spent yelling he spent an equal amount of time trying to teach them. He repeatedly told them that it was their jobs to learn about the patients and that they should do more than just memorize their charts. He did his best to teach them how to be great doctors, but there were a few things that really stuck out to me. On the first day, one of the interns walked in to observe rounds. He had a few patches of hair on either side of his cheeks, like he was trying to grow a beard but it would only grow in some spots. Dr. Shrecondey started yelling at him "Are you trying to grow a beard? If you are that is fine, but to me it just doesn't look like it is going to happen. It is ok to have facial hair if you are going to have a beard, but if you are not then you need to keep you face shaved. Your face looks like a mess. I want you to go home and shave. Come back when you look like a doctor." This guy didn't say anything; he just turned around and walked out. He came back about 45 minutes later clean shaved and got some more teasing "See now you look way better, how many proposals did you get on the way over?" I thought this whole thing was hilarious, but I bet this guy was so mortified. Either way I bet he never comes in with an unshaven face again. By the end of my two days I learned so much from pediatrics and I also learned that I would not do well as a pediatrician. The whole time I was there I felt constantly sad; it was just so hard to see all of these sick kids. I am grateful that there are people out there who are great pediatricians and they love doing it, but it is one thing that would just be too hard on me.